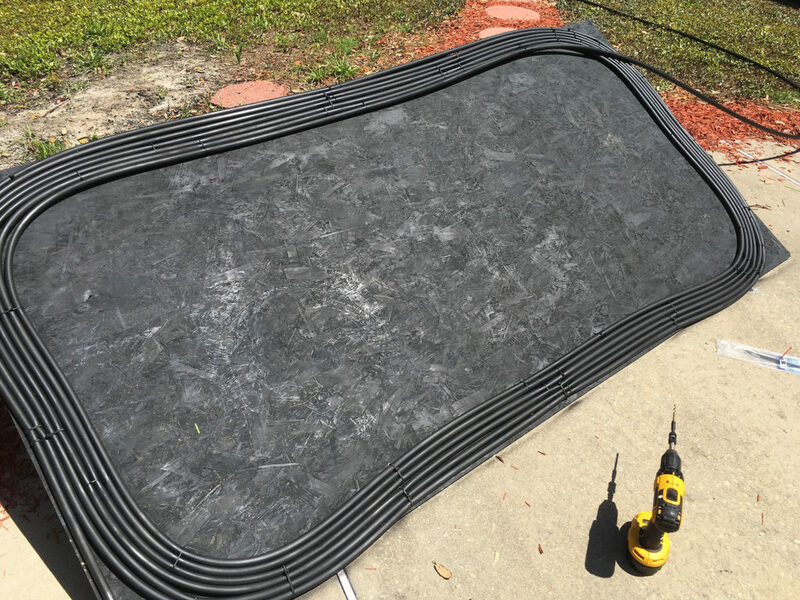 Let’s talk about DIY Solar Pool Heater Black Hose. Its that time of year again. The weather is warming up and the kids are ready to jump in the pool but it’s still cold! 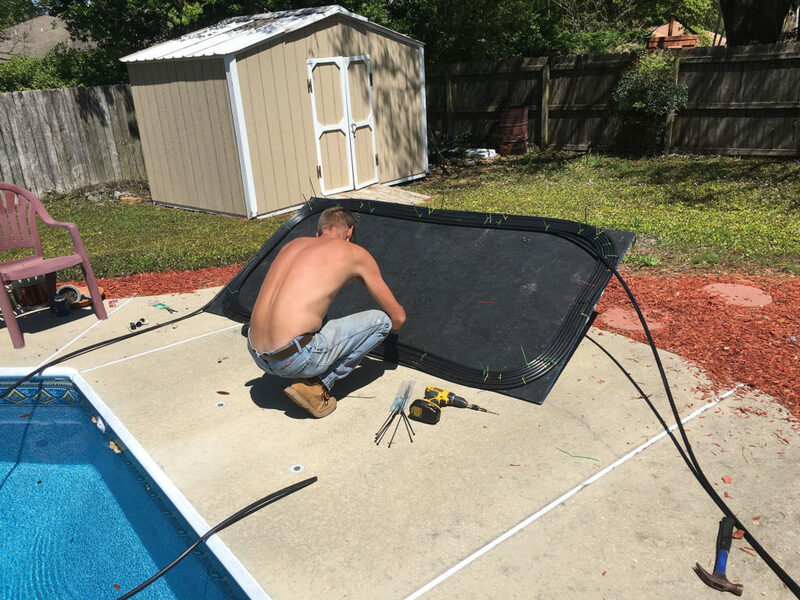 Here I’m going to tell you about my experience building a DIY Solar Pool Heater Black Hose. 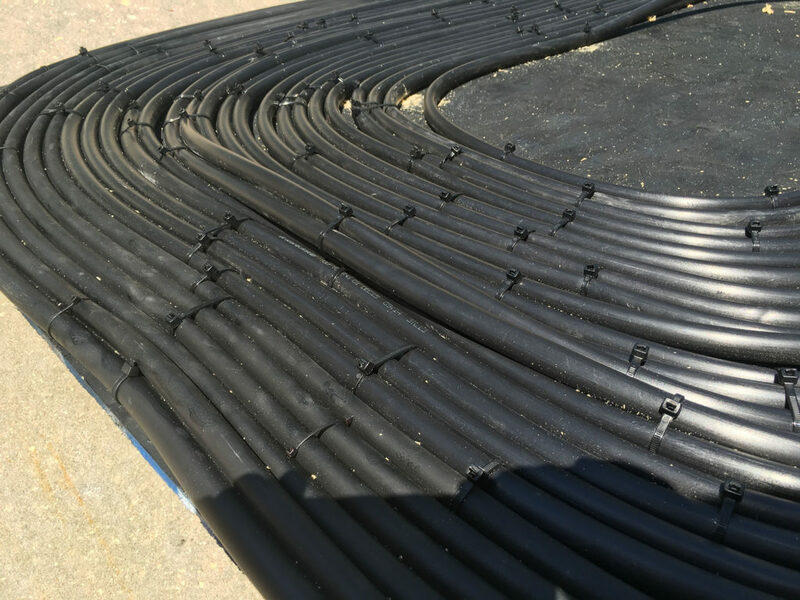 First things first, gather all the materials for your DIY Solar Pool Heater Black Hose. First, material is a 4×8 sheet of treated plywood for use outdoors. You want to pick this up from a local hardware store, the rest of the supplies can be purchased online for convenience. You will also need black hose, we chose Rain Bird irrigation hose at 500 feet length. A pack of 150 zip ties. We drilled through the board and used zip ties to hold the hose to the board, you can see how we did it in the time lapse video below. Now managing hose of this length is no joke. You’re going to want to be careful not to get it all twisted and kinked and tangled. Trust me this takes concentration. We began on the outside of the plywood and followed the edges keeping the turns as tight as possible. There was no rhyme or reason to our placement of the cup ties and their corresponding drill holes. You’ll have to make that call as you see how things go. One to two zip ties on the short sides and 2 to 4 on the long sides seemed sufficient. We were pretty contentious about laying out our black hose pretty cleanly so it took a total of about 8 hours over the course of two weekend mornings to complete it. 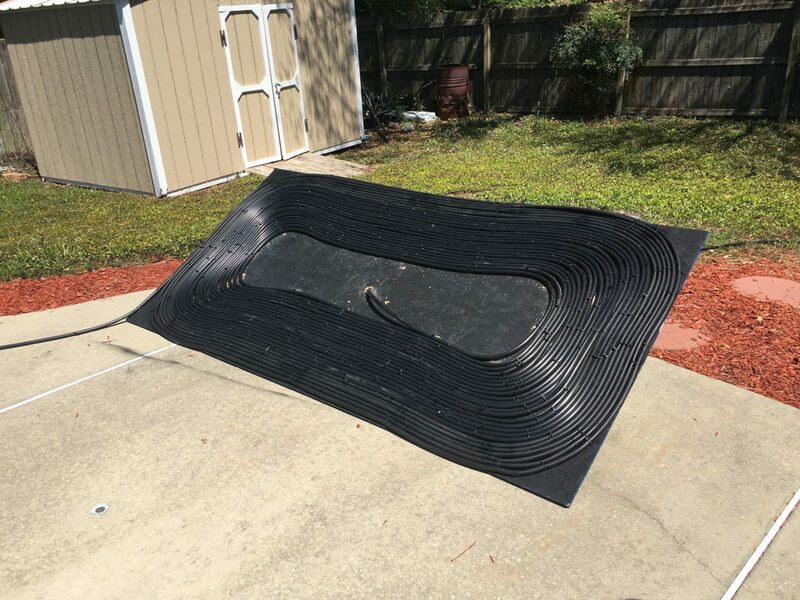 We got it finished and drilled a large hole the diameter of the black hose through the center and ran the hose out the back as you can see in the completed images. It made it easier to deal with. We ran the intake portion over to the jet return to the pool and stuck it in there. The exit hose was ran to spill in the pool. The water took about 4 minutes to make it through the 500 feet of hose and when it came out it was warm!! Slowing the flow down by kinking the exit hose was how we controlled the heat. We got it to the point where it was coming out slowly but quite hot. After a while, using the pool pumps jet return to power it turned out not to work so well. If you tap in to the PVC lines that carry that water Im sure it would work really well but we didn’t want to disturb the pool’s pipes. You can use your own discretion on that part. We needed up getting a cheap 24v variable speed pump to send the water through it. The only reason I chose 24v is because I already had a 24v power supply hanging around unused. You can pick any pump you like. If you come up with a better way, please let us know in the comments, we’re all ears! All in all, we had a lot of fun and it was an inexpensive project that helped us get the pool up to swimming temperature faster than the neighbors. Hey man, I got them off eBay. Here ya go. Would love to see how yours come out! For those looking after this eBay listing expires search for ‘fiber optic 200’ You’re looking for a 200 strand fiber optic bundle in assorted lengths. can you show me what kind of pump you used?